For years, we’ve demonstrated all this great wisdom in everyone else’s garden or landscape and my former personal gardens too. Now, finally, we’ve been doing it at my place long enough to really see the tangible results of our practices. The common denominator to why all my plants and lawn are thriving is the soil. It’s my ongoing commitment to always building the soil health. Simply put, when you feed the soil, the soil feeds the plants in the best way possible. And there’s one other player that I attribute to the success of my lawn and landscape: Milorganite. The organic nitrogen in this fertilizer product is itself a direct result of billions of microbes that safely add an extra boost to help build my soil and stimulate my plants and lawn to grow naturally. As an organic gardener, whatever ingredients go into making my soil productive can’t be negated by inorganic inputs. That’s why if I’m purchasing a fertilizer, it has to be a good fit into my soil-building protocol. Healthier plants mean deeper roots, better water filtration and drought tolerance. That leads to a healthier soil environment and overall improved vigor in everything above ground. Hopefully you’ve gotten the picture that it doesn’t take much to achieve big results over time. I typically repeat this process twice a year in spring and fall. While you should see good results quickly, the best results will occur over time. But I assure you, it’s worth the wait and money in the bank. 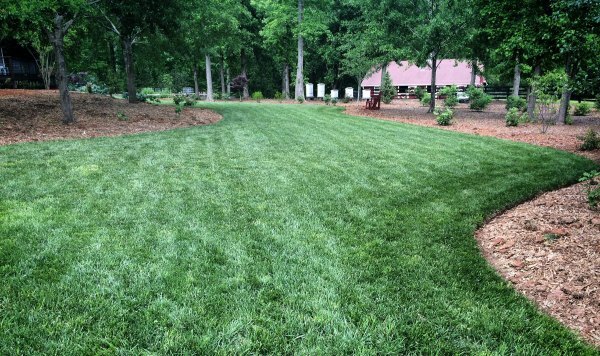 Disclosure – Milorganite is one of our brand partners. However, that has no influence of their mention in this post. It is a key step of what I use to get the results described above so it’s important to include that here. Rest assured the thoughts and opinions in this and all posts are always and solely my own. I only accept marketing relationships when I genuinely believe in a product or service, use it personally, or believe it to be good information worth sharing with my audience. Such is the case here. I like how you said the common denominator for thriving plants is the soil. I am thinking of getting my soil in my garden remediated for better plants. Thanks for the tips on how to improve soil. Joe, thanks for all the info, love your program. We’ve just moved to east Wichita, KS, and the soil here is alkaline and hard clay sod. Hard as a brick when dry. I’ve already double dug to about 16 inches down, and supplemented with bagged compost, peat moss, agricultural gypsum, and sand trying to break down the clay and raise the acidity. Made raised beds by throwing all the remediated soil into the beds and the walkways down to clay with mulch to walk on. The garden soil still needs help. Will have to be using city water which is slightly alkaline too in my drip irrigation. How can I speed up the soil improvement? Would like to have it up to 100% for next year. Oh, we have Bermuda grass which I consider invasive, and to keep it out I dug a trench 16 inches deep, installed a wall from the bottom up to one foot above ground. It’s plywood and I know it won’t last forever but will have to address that when the time comes. I appreciate all you do and have done for us frugal gardeners out here. Have to say, I’m more than a little jealous of where you garden. Not as harsh as Kansas. YOU HAVE INSPIRED ME TO GIVE ALL ORGANIC A GO. I CANCELLED MY LAWN SERVICE BEFORE SPRING. I FERTILIZED WITH AN ALL NATURAL WEED PREVENTION CORN GLUTEN MEAL PRODUCT. I AM ALREADY SEEING GOOD RESULTS. MY NEXT LATE SPRING APPLICATION WILL BE WITH MILORGANITE. I STARTED 3 COMPOST BINS WITH USED PALLETS. I PLAN TO LAYER THE COMPOST IN THIN LAYERS, TO NOT LET THE PILE GET HOT, AND LET NATIVE WORMS DO THE WORK. I NOTICED THAT IF A PIECE OF PAPER OR CARDBOARD LAYS ON THE GROUND I USUALLY FIND WORMS UNDERNEATH WHEN I PICK UP THE LITTER, SO THE COMPOST SHOULD EASILY ATTRACT WORMS. I AM LITERALLY COMPOSTING EVERYTHING ORGANIC INCLUDING ALL JUNK MAIL, SALES ADS NEWSPAPER, AND EMPY DRY FOOD BOXES, EVEN GOING AS FAR AS CUTTING THOSE PLASTIC WINDOWS OUT OF THE ENVELOPES. IT SAVES ATLEAST A FULL BAG OF TRASH A WEEK. AFTER THE BINS ARE FULL TO THE TOP I WILL STOP ADDING, MAKE MORE BINS AND THEN KEEP AN EYE ON THE FIRST BINS TO SEE HOW LONG IT TAKES FOR THE DECOMPOSITION. I ALSO PLAN TO INSTALL MY FIRST WORM TOWER IN ONE OF MY RAISED BEDS TO SEE HOW WELL THAT WORKS. WELL ANYWAY AS YOU CAN TELL I CAUGHT THE ORGANIC BUG AND I’LL LET YOU KNOW THE RESULTS IN A YEAR OR SO. IF YOU CAN SUGGEST ON WHERE TO PURCHASE A WEED TORCH I WILL CHECK IT OUT. I ordered mine online Forrest. Search for flame weeder or weed torch. Good luck with your organic gardening adventures! Hi Joe, long time fan and viewer here. Congrats on the Grant! I voted and glad to see you received. A question for you : I’m at a mile high elevation here in Colorado and have 2- 24’X 24′ plots in an all organic community garden. The soil has probably 70 % sand and 30 % clay, located in an old watershed, stream bed, horse pasture. I have amended the soil with compost for 5 yrs. now, along with nitrogen and steer manure. Our growing season runs from the end of May through middle of October. I am wondering what type of mulch you use/recommend in your vegetable garden. I have tried straw and hay, but even when told that was weed free, it turned into a weed disaster. Any ideas? Thanks so much and looking forward to your new season. Love the website too! Hi Jack. I usually use pine bark mulch in my raised beds now. I’ve used straw for years without the weed issues you mention. Not sure why that was happening, except if you used hay that had the seed heads on them. Then, you will def. get germination of those. But they don’t last long and die in the heat. So any kind of finely ground natural wood mulch would be my suggestion. Having retired from a bio-solid compost facility in Texas, you cannot prevent heavy metals in the compost . But it being made from bio-solids, it is one of the most tested compost on the market, as is all the bio-solid compost facilities. Thanks James. This is exactly what I learned as well from studying the process as well. Please advise ratio and distance for proximity to plants when using Milorganite. Congrats on the grant! I voted and am glad you were awarded! I enjoy the show very much and thank you for bringing it to us. Thank you so much for this information. I always wondered what Milorganite was, now I understand what it is. I live in high mountain desert that is a mile up in Colorado and the soils is heavy clay. We have a lot of intense sun shine. I will use the Milorganite and see what it does for the lawn here. I love your show and web site you are so insightful and knowledgeable. Congratulations on the grant, I did my part by voting and am so glad that came through for you. Keep up the great work, we love you out here. Thanks Renee. Your kind words are very much appreciated. And you’re welcome on the info. Irene, I see organic container or potting soil readily available at all the box stores and garden centers now. It’s always prominently displayed. If you don’t see it, ask someone to find it for you. It’s a very in-demand product now so I would think you should have no problem locating it now. I have a rather large garden area. No raised beds. So should I try and treat the entire area, with compost? Or just treat the plants in their individual planted holes? Thank you for the tips. New follower and not a very successful gardener so far but have enjoyed your site so far. Hey Shannon. At the least, amend the area around the hole with some compost. A little goes a long way but I realize it is often difficult to cover the entire area. So start by making sure you’re getting it to where the roots will be of whatever you’re planting. If you have leftovers, save it or work it in to the top few inches around existing plants. It’s stunning what you’ve accomplished in so short a time. The pictures are great and I look forward to seeing the shows. I can never see too many videos of gorgeous gardens and landscapes. My husband and I planted some young trees about six years ago and they have really taken off this year with all the rain we’ve had in central Virginia near Charlottesville. Having a forever landscape is so rewarding. Every good thing you do, like improving the soil, returns your effort far beyond what you expected. Can’t wait to see what’s next for you. Sometime in the 80’s I read or heard of issues with heavy metals in Milorganite production.. . Any truth to that? Enjoy your shows and posts!